Supported by the Hopkins Fund in the Department of English, the Actors from the London Stage will also host a variety of classroom workshops through the week with a focus on understanding and speaking Shakespearean verse, acting, principles of rhetoric, public speaking, and understanding the power of body language. 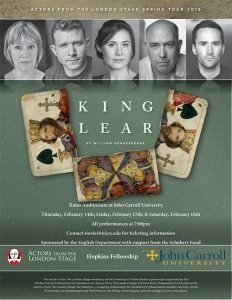 The AFTLS residency at JCU will culminate in three performances of “King Lear” in Kulas Auditorium on Feb. 14, 15 and 16 at 7 p.m. Each presentation is open the local community. Tickets are available at the door ($10 for adults and $5 for students). Before they dazzle the community with their unique brand of minimalistic theater, the AFTLS will spend a week giving in-class workshops across academic disciplines including English, Counseling, Classics, Theology and even Tax. In these sessions, the actors will provide a dynamic, hands-on approach to heighten each student’s intellectual curiosity regardless of discipline. Actors From The London Stage is a residency program that has toured American colleges and universities since 1975. Each five-actor troupe features a rotating, gender-fluid cast of classically-trained British actors from such prestigious companies as Shakespeare’s Globe, the National Theatre, and the Royal Shakespeare Company. Its five-day residencies include tour de force performances of a Shakespeare play and dozens of collaborative campus workshops tailored to enrich coursework across the academic spectrum. 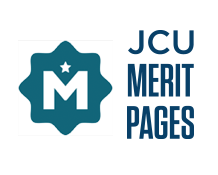 Actors are auditioned and selected in London by a board of Associate Directors. Named for Jesuit poet Gerald Manley Hopkins, the Hopkins Fund was established by Barbara S. Schubert ’62, ‘67G, ‘80G and family to endow literary events related to British literature. Learn more on the Actors from the London Stage at their website.